Compare What an Acrylic Aquarium and Glass Aquarium Have to Offer! So, you’ve decided to install an aquarium. What should it be made of? There are two main materials the walls of your tank can be made of: glass and acrylic. What are the differences? How do you decide if a glass aquarium or an acrylic aquarium is right for you? 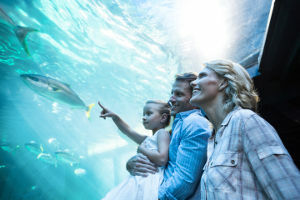 The three main things that differentiate glass and acrylic aquariums are how resist damage, how much they weigh, and how much insulation they provide. There are some more minor distinguishing factors as well. Let’s take a closer look at each of these differences. That way, you can make an informed decision on which kind of tank you want. For a more comprehensive guide to designing your own custom tank, click here. The first difference between glass and acrylic aquariums is how they stand up to damage: glass aquariums are scratch-resistant, while acrylic aquariums are shatter-resistant. Which one you prefer depends on your situation. Acrylic is strong but soft, so it won’t break but accumulates scratches. Fish can even scratch acrylic from the inside. If a professional technician handles most of your maintenance, they likely won’t be so concerned about big impacts. Instead, they worry more about making small accidental scratches with their tools. That’s why commercial aquariums in hospitals and other workplaces tend to prefer glass tanks. They minimize the unsightliness and murkiness caused by scratches. However, if you’re installing a residential aquarium, you might prefer acrylic. You may have children running about and throwing things around. Maybe you have other reasons to worry about something hitting the aquarium as well. Glass protects against scratches well, but it’s brittle and shatters when there’s a big impact. That’s why you might prefer an acrylic aquarium in this situation. Keep this additional detail in mind, though: scratches on acrylic can be buffed out, but scratches on glass can’t. Scratch glass, and you’re stuck with it unless you replace it. If you scratch acrylic, you can take some extra time and polish off the scratches out with wet sandpaper. That’ll make it look good as new. The scratches caused by fish on the inside of the tank, however, will take a bit more time to get to. The next major difference between a glass aquarium and an acrylic aquarium is weight. Glass weighs significantly more, and this matters more and more for larger tank sizes. How much more? Well, depending on size, an empty glass aquarium will weigh almost twice as much as an empty well-built acrylic aquarium. At smaller sizes, this isn’t too big of a deal. A 55-gallon tank weighs about 42 pounds when made of acrylic and about 78 pounds when made of glass, but requires 2 people to lift either way. However, at larger sizes this can create more of a problem. A 500-gallon acrylic tank weighs about 600 pounds and needs 5 people to lift, while a 500-gallon glass tank weighs about 1,050 pounds and requires 8 people. If you’re getting a larger tank and are worried about a potentially difficult installation process, or if you foresee picking up or moving the tank at any point, weight is an important factor. That’s why an acrylic tank that weighs less is a better choice for large aquariums. To get an idea of approximately how much your aquarium might weigh, use this tank weight calculator. The third major difference between a glass and acrylic aquarium is how they hold heat. Glass lets more heat out, while acrylic holds more heat in. Just like with the first point, which of these is preferable depends on your situation. This results from differences in how these two materials are structured on a molecular level. Heat penetrates glass more easily because it's more chaotically structured and lets the heat escape. Acrylic is more crystalline and uniform. That allows it to insulate better and keep more heat in the aquarium. If your aquarium has problems with overheating, especially in the summer, you may want to consider switching to a glass tank. On the other hand, if your aquarium has problems holding heat, you may want to switch to acrylic. This is especially important when you have an aquarium where temperature is more important and has to stay within a narrower range, such as a community aquarium with a coral reef. Visual distortion—You may have noticed when looking at a glass aquarium that the glass somewhat distorts your view of the inside of the tank. As we discussed above, acrylic has a more uniform, crystalline structure. This makes it optically clearer than glass, with less visual distortion. This difference isn’t all that noticeable on smaller tanks with thin panes of glass or acrylic, as glass tech has been catching up in recent years. Still, the bigger the tank and the thicker the pane, the more of a difference. If you don’t want thick glass distorting your view, that’s one more pro for acrylic. Cost—A glass aquarium tends to be cheaper than an acrylic aquarium. At smaller sizes, even higher-quality glass has comparable pricing to acrylic. Bonding and seams—A variety of methods join glass aquariums together at the seams. An injection-molded frame may hold it all together, improving durability but impairing your view a bit. Silicone doesn't impede the view, but it's not as durable. On the other hand, acrylic chemically bonds together at the seams. This lets you have both strength and an unimpeded view. Filter and pump installation—Installing a sump and tubing may often require drilling. Since acrylic is plastic, this doesn’t pose any issues and you can do it yourself. Glass necessitates you first make sure it’s not tempered, and then you drill at your own risk. If you’re performing this task yourself, it’s certainly easier with acrylic. So, now you know all the important differences between these two materials. Which will you choose? If you still have questions, want advice, or are ready to take the next step, call Living Art Aquatics at (847) 737-5151 or stop at our office in Crystal Lake. We’ve been designing, installing, and maintaining aquariums for over 20 years, and will guide you through the process of installing a glass or acrylic aquarium in Crystal Lake, IL or the greater Chicago area. Together, let’s make something that’s truly a living piece of art!